When my Accents of English came out nearly thirty years ago, more than one person told me they thought that the last chapter (ch. 9, ‘The Imperial Legacy’) was the weakest. So I was interested to see the publication of a new book in the EUP Dialects of English series, entitled Indian English. 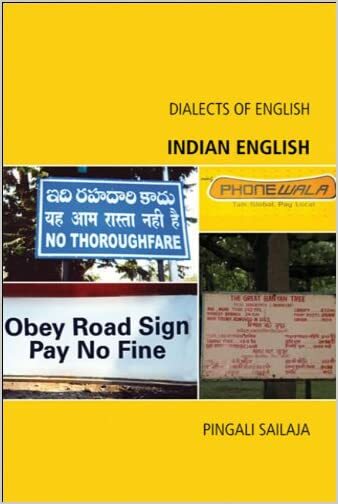 It is by Pingali Sailaja of the University of Hyderabad, and contains a substantial chapter on pronunciation. Sailaja makes a useful distinction between Standard Indian English Pronunciation (SIEP) and various kinds of non-standard pronunciation strongly influenced by the phonetics of the speaker’s L1. On the question of rhoticity, for example, where I wrongly said that “most speakers have a more or less fully rhotic pronunciation” (p. 629), this author asserts that SIEP is non-rhotic, but “most non-standard varieties of IE are rhotic”, although “there are those whose speech would be somewhere in the middle of the cline but they may still have non-rhotic speech” (p. 20). So he she sees nonrhoticity as standard, but rhoticity as a strong marker of non-standard speech. In Indian English p t k are well-known to be unaspirated. With the exception of Tamil, Indian languages have a phonemic opposition between aspirated and unaspirated plosives. This is exploited for the voiceless th sound: we regularly get aspirated t̪ʰ where other varieties of English have θ. (Indian languages have no dental fricatives, nor usually does SIEP: “the sound /θ/ is sometimes articulated in SIEP but /ð/ is almost completely missing”.) If you hear a speaker of SIEP pronounce thing as t̪ɪŋ rather than as the usual Indian t̪ʰɪŋ, that probably means he or she is a speaker of Tamil. Sailaja points out that if the aspiration of voiceless th were due purely to the influence of spelling we might expect d̪ɦ as the counterpart of ð: but in words such as this, mother, bathe we in fact get plain d̪. Then again, though, we do get ɦ in ghastly, ghost and also in John and sometimes in why wɦaɪ, which must certainly be due to the spelling. Our stereotype of Indian English (or my stereotype, at least) has v and w merged as ʋ, with no distinction between vet and wet. Sailaja asserts, however, that “the distinction is maintained in SIEP”. He She thinks of this as a spelling-based distinction, which is reasonable — though it’s not how we core English speakers think of it, and not how it arose historically. Non-standard varieties of IE do not maintain the distinction. The advertisement for a recent Hindi film that says ‘villager, visionary, winner’ is obviously meant to be alliterative. And so finally to linking and intrusive r. The Indians are different from the English. I hear /v/ and /w/ merged in every Indian non-native speaker of English I've ever heard. The actual realization may not necessarily be [ʋ]: it may vary between [w], [v], a lip-rounded bilabial fricative etc. I think that what you said in AofE is pretty much on the mark here. The confusion you have is because the term "aam" has two semantic realizations: 'mango' and 'ordinary'/'common', much like the English term BANK can mean the riverside or an institution having a lot to do with money. I'm somewhat doubtful on the non-rhoticity of SIEP, but I agree that we don't merge /w/ and /v/. @John_Wells: "Pingali Sailaja" is most probably a "she" and not a "he"
@vp: "aam"="mango" and "aam"="public" are homonyms in Hindi, the former > Sanskrit "aamra", the latter > Arabic "ain-alef-mim"
@vp: PS: In case you are familiar with written Urdu, the two "aam"-s aren't homographs in Urdu. I consider myself to be natively bilingual in English and Marathi. But English is my dominant language by far. The claim of SIE (if there is indeed such a thing... I'm not fully convinced) being non-rhotic strikes me as somewhat dubious, especially when one takes into account the already heavy and ever-increasing influence of American English on young urban Indians. The choice of t̪ʰ from among native Indian phonemes to substitute for θ strikes me as felicitous: it incorporates dentality, voicelessness, as well as a ghost of a fricative in the form of aspiration. The reason for the substitution of ð by d̪ seems pretty straightforward to me: the frication in the case of ð even in RP etc tends to be relatively weak, with it often being realised as d̪ (http://en.wikipedia.org/wiki/Received_Pronunciation#Consonants). I suppose these (and perhaps other) realisations have been in place since before Independence. @vp: Homonymy is what deceived you. If one had to write 'This mango is not a road' in Hindi, one would indeed write what's written on that sign. However, 'aam' as an adjective means 'common, ordinary'. So what that sign actually says is something like 'This is not a public road'. In speech, thanks to stress and intonation, the chances of a misunderstanding are very low. Agree with Anonymous. "Sailaja" seems to the be the author's first name, and is normally a female name. "Pingali" is a Telugu patronymic, most likely the author's father's first name. I once had a Tamil colleague explain to me that he's had to learn three kinds of English: The English he speaks at home, the English he speaks with other (non-Tamil-speaking) Indians, and the English that he speaks with Americans like me. I associate Indian English with eccentric stress placements. Annoyingly, I can't think of any specific examples - it's one of those things where you notice the tendency, but forget the details - but a plausible made-up example might be "generate" with stress on the penultimate syllable. Is this as common as I imagine? Is it mentioned in the book? Most, if not all, Indian languages do not contrast stress positions; and this shows in their English as well. Most people don't even distinguish REBel vs reBEL or REcord vs reCORD. Noteworthy examples of different stress placements are: e-LEC-tri-city as opposed to e-lec-TRI-city and DE-fi-ni-tion as opposed to de-fi-NI-tion. @ Leo: That is mentioned in Accents of English. John gives examples like [ˈiːʋɛnts] for events. Other examples with penultimate stress given (originally from Bansal) are [suˈteːbl] suitable, [ˈɛbaʊt] about, [ˈmɪstek] mistake, [mɪˈnɪstər] minister and [ɛtˈmɒsfɪə] atmosphere. I have a friend from Mumbai. I pointed out once how some Indian restaurants spell "kurma" rather than the usual "korma". He told me that would be the usual pronunciation in India (he pronounced it with the CURE vowel). I am someone who always separates CURE from NORTH/FORCE, but had never heard of using the CURE vowel in "korma". I have checked this in a few dictionaries, and have yet to find a British dictionary that lists the spelling "kurma". I expect Indian dictionaries would include it. It's strange to talk of a standard variety of Indian English since most Indians learn English as a second language at school... but if it is considered to be the variety spoken by people educated in English-medium schools, then yes, SIE is non-rhotic - while American English is responsible for a lot of words and phrases used by young urban Indians (for example dude "guy", bucks "money/rupees"), it has yet to influence the phonetics of SIE. क़ोरमा (qormā) [from Turkish qavurma]. a lightly spiced fried curry. I would normally expect a Hindi ओर to correspond to the FORCE vowel in Indian English. "Kurma" is the usual spelling in the U.S., which is divided between unmerged CURE and CURE=NURSE. I have the former. "In Indian English p t k are well-known to be unaspirated. With the exception of Tamil, Indian languages have a phonemic opposition between aspirated and unaspirated plosives. (...) If you hear a speaker of SIEP pronounce thing as t̪ɪŋ rather than as the usual Indian t̪ʰɪŋ, that probably means he or she is a speaker of Tamil." The first sentence doesn't seem to agree with the remainder: why don't IE aspirate /p t k/ if Indians have a native phonemic distinction between aspirated and unaspirated vowels? Even tho' Indian languages have the said contrast, my theory is that Indians encountered unaspirated /p k t/ before the aspirated versions of English - possibly thru' French or Portuguese, and applied these sounds to English as well. @Leo: "I associate Indian English with eccentric stress placements." My father was Anglo-Indian. He spoke English natively as a first language, with passable Hindi but no Dravidian languages (unlike most of the rest of his family), despite growing up in the South. His word stress occasionally differed from mine (pretty much RP) in a number of words. Those that immediately spring to mind include 'hamburger' (stressed on the second syllable), Agatha (as in Christie) (also stressed on the second syllable). He also occasionally used w in place of v ('wery good'; Queen Wictoria) but rarely the other way round. And his English was non-rhotic. I'd be interested to see if the book has anything to say about Anglo-Indian speech. I'm afraid Anglo-Indian and "Indians educated in English" speech hardly differ. You ask why Indians map English /p t k/ (and, I would add, /tS/) to the unaspirated rather than the aspirated consonants of their native languages. * historical reasons: probably the English of those who first brought the language to India was less aspirated than today's. * the aspirated consonants (at least in Hindi) are generally less common than, and thus marked relative to, the unaspirated ones. (The aspiration may also be somewhat stronger than in English). So the unaspirated consonants would be the more natural choice. Of course, the English consonants are also unaspirated when preceded by /s/ or uninitial and unstressed. Government of India cheated Indians by adopting the British way of learning English in India. According to educational psychologists, you can't teach first language and second language in the same way. The mechanism of learning one's first language and second language is different. How can an Indian learn a second language like English in the same way it is designed as a first language for a British boy / girl? That is the root cause of Indian's poor English. (I don't forget the fact that there are few islands which excels in English in India.) At the same time, don't forget the statistics. 85% of Indian technical people are not-employable because of poor English. 94% of Indian Management graduates are not-employable because of poor English. Experts say the only way to make them learn a second language is through a theme you are passionate about. It is called content-based instruction / theme-based learning. How many universities teach English through content-based instruction / theme-based learning? Professors don't allow, they are conventional. That is the reason, islands of excellence like Espoir technologies, the company which pioneered the content based instruction / theme-based instruction in India is still in the good books of professors, even though it is widely accepted in industries. @vp: Yes, aspirated stops in Indian languages are more strongly aspirated than English (stressed initial) stops, so it may be that Indians don't perceive the aspiration in English. I'd say the main reason why IE has unaspirated stops is spelling pronunciation - why pronounce something that isn't "there"? In fact, IE has voiced aspirated stops where the spelling suggests that. Some words that come to mind are [ɡʰo:st] 'ghost', [ɡʰa:stli] 'ghastly', [bʰu:tan] 'Bhutan'. To Kilian's question on "why don't IE aspirate /p t k/". With the exception of Tamil, most major languages of India have aspirated forms for /k g(hard) ch j(soft g) t(hard) d(hard) t(soft) d(soft) p b/. Moreover, when letters of Roman alphabets are mapped with their corresponding vernacular letters; the Roman alphabets are rendered phonetically the same way as the native letter. So, a speaker of Indian English will be conscious not to add superfluous 'h' (or the puff of air) when the letters do not suggest that. So, KING is spelled /KI-NG/ and never /KhI-NG/. Another, difference is that the South Indian English speakers pronounce 'th' and 'dh' as soft 't' and soft 'd'; while the North Indian speakers tend to aspirate 'th' and 'dh' because the letters suggest so. Found your blog. Its really nice on English to Marathi dictionary.I appreciate your article. It's really important to get a good dictionary to understand the language and learn it clearly . So thanks for sharing all that important information.